In this article we look at 5 Effective Offline Marketing Ideas for your Business. While most businesses give preference to online marketing these day, offline marketing can still play an important role in your marketing strategy. When executed well, offline marketing can be extremely effective and deliver great results for your business. To truly get the most out of your marketing budget it is a good idea to combine both online and offline marketing campaigns. For the best results those campaigns should run simultaneously and complement each other. Here are just 5 ways to include offline marketing in your marketing strategy. Many regard traditional print marketing such as poster or leaflets as old fashioned. The reality is there is still a place for this type of offline marketing – and it still yields great results for your business. The more creative you are with your design and your message, the higher the chance that your printed marketing materials will stand out from the crowd and get noticed. It is always worth hiring a designer to create bespoke designs for your marketing materials. It is a mistake to use templates and end up looking similar to your competitors. 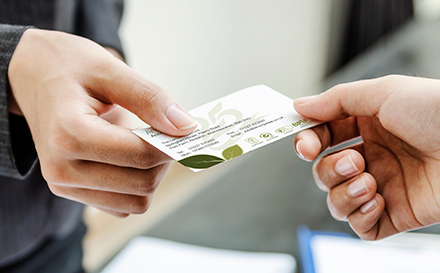 Even in today’s digital world, the business card can still be an effective way of raising awareness of your business and sharing your contact details. Being creative with your business card with ensure that you stick out in the minds of the people that you give them to. It’s always handy to keep a few business cards on you at all times. You never know when you might need one. You should encourage all your employees to do the same. As consumers we often buy with our eyes. We judge the quality and authenticity of a product by its packaging. If your business operates in a competitive market, investing in good quality packaging that is a little bit different to the norm could result in a great ROI. A great example of this is Pizza Hut, they recently created pizza boxes that turn into a projector for mobile phones; because pizza’s and movies were made for each other. If your budget allows, billboard advertising can be incredibly effective. Billboard advertising space doesn’t come cheap though. If you are thinking of adopting billboard advertising into your marketing strategy then go big. You need to make the most of your investment and the opportunity. The most important things to remember when considering this type of advertising is that your design needs to be eye-catching. The advert needs to include a clear call to action as well as your contact details. I was always taught to design a billboard as if it is the size of a business card. That way when it is scaled up it has real impact. There is tendency with a billboard to use lots of images and elements because you have the space. This approach rarely works well in my experience. Rewarding your customer’s loyalty can go a long way to making your customers feel valued. It is a great way to incentivise them to remain loyal to your business. By rewarding them with gift vouchers or discounts via direct mail you can often add that personal touch to your business that is hard to replicate in the digital world.